The final piece in the series of Phantasy Star IV pair images brings us Chaz and Hahn. One does not see these two paired together often, even though they meet very early in Phantasy Star IV. One might think that Hahn, as a teacher, might take an interest in expanding the horizons of young Chaz. Instead, he misses out on much of Chaz's character development. Chaz does not truly come in to his own until long after Hahn has left the party. You may view the gallery page for Chaz & Hahn. It'd really be interesting to see how these two act when they're alone - like on a little side-adventure or something. Perhaps with someone's creative imagination, it can be develop into a decent fic? Hahaha - no wonder Rune called Chaz "shorty", look at how tall Hahn is compared to Chaz. Whoa Now that I'm seeing this image more clearly (i.e. I got enough sleep and I just got home from work)... Either Hahn's freakishly tall or Chaz's a midget. Is this picture to scale? No, they pretty much ignored the scaling on this image and others in the same set. Hahn is taller than Chaz, but not as tall as this image might suggest. 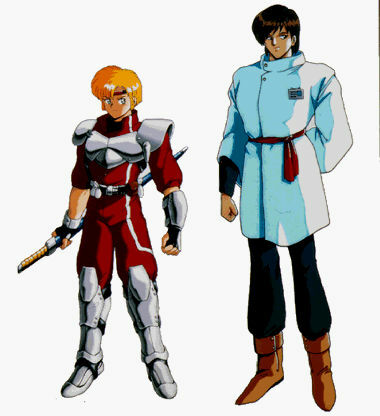 According to the Phantasy Star: Official Production Compendium, Hahn's only two centimeters (about an inch) taller. Bumping up this former Image Of The Day! Nicely drawn and colored images. Hahn does look a tad tall here and a little too beefed up at the top, imho. Ah ! A classical picture here ! Nice color drawing !